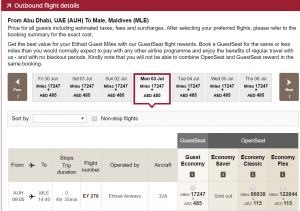 For my Trip Around the World, I needed to book a flight from Abu Dhabi to the Maldives. I saw a great opportunity to use my AA miles using the partner award chart. 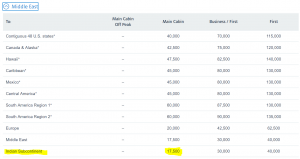 The AA miles required for a partner award from Abu Dhabi to the Maldives is 17,500. Not the best redemption but I had no choice at the point since my main credit card spend is on the Citi Thank You and Chase Sapphire Preferred credit card. These credit cards do not earn AA miles. After I transferred over the miles, they were in my account in about 5 minutes. I then proceeded to call the AA reservation center in Australia to book the Etihad flight. You can’t book these awards online and they need to be done over the phone.I made the call over Skype. I did the exact same process when I completed my booking of the Etihad Apartment using AA miles. Please read that post to get the exact details of the process. Agent was able to pull the flight up, get me two economy seats and I was booked! This all took only 10 minutes over the phone. Side note: Per the agent, we were the first two booked on this flight. I like to plan early! I got a great redemption here. Flights for the day that I needed, cost $813 one way!! So for 35,000 AA miles, $140 transfer fee and $64 in taxes, I got $1,600 worth of travel! After booking this flight, this leaves me with only one more flight to book using awards. Which is the Male to Singapore flight on Singapore Airlines. I’m currently at 18,000 Thank You Points and I need 35,000. So hopefully by sometime in Spring 2017 I will have these miles. I then need to pay for my tickets from Australia to New Zealand. I’m hoping I can find a good deal on Air New Zealand. I would really like to try out that airline. But we shall see. I will post later on what flights I end up booking. I hope you are able to see the power of the AA partner award chart and some of the sweet spots. This was definitely one of them.